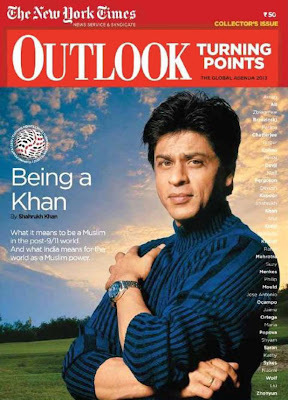 Reality of Indian secularism is exposed again and again by shameful incidents against the minorities by the Hindu extremist groups but this time India's most popular celebrity and King of Bollywood Industry Shahrukh Khan has himself exposed the real face of Indian secularism by writing an article in the Outlook magazine about how Muslims are facing discrimination in India. 47 Years old Shahrukh Khan has said in the article that Muslims are seen with the suspicious eyes In India and even me is called a unpatriotic person many times while my father fought for the independence of this country. Shahrukh Khan also says in his article that many times politicians have told me to go to Pakistan. Bollywood Superstar also said that he is blamed for having soft corner for Pakistan. He also written about how he is stopped at US Airports again and again for being a Muslim.